An orange is a citrus fruit from the Rutaceae family. Orange trees are one of the most cultivated fruit trees in the world and are widely grown in tropical and sub-tropical regions. Oranges grow best between about 15 degrees C and 30 degrees C. They love lots of water and sunshine. Oranges are an excellent source of vitamin C providing about 48mg per 100g which is about 80% of your RDA. 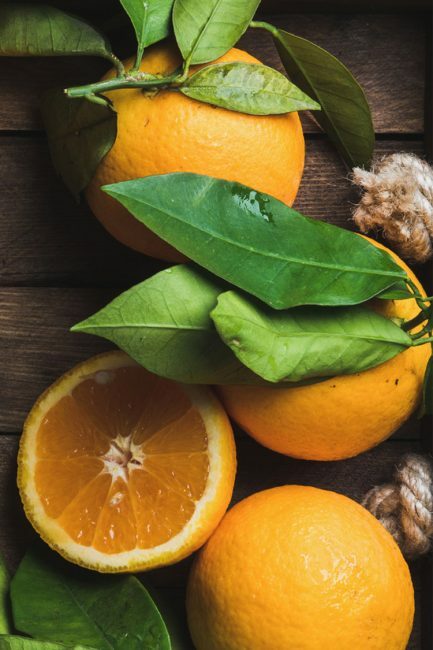 Oranges also contain very good levels of vitamin A, and other flavonoid antioxidants such as alpha and beta-carotenes which have anti-oxidant properties. Vitamin A helps maintaining healthy mucus membranes, skin and is essential for healthy vision. Being a rich source of citric acid and citrates, oranges may help prevent kidney stone formation also. We always have, and always will juice our own oranges daily and can promise you’ll never get any cartons of pasteurised orange juice or orange concentrate in our juices or smoothies. Almost all “bought in” orange juice is pasturised and most nutritional value has disappeared resulting in little more than processed tasting orange coloured sugar water. We choose oranges specially for juicing from Spain during the summer and South Africa or Brazil during our winter months depending on where we can find the sweeter fruit and juice every day.